Ingredients: Cannabidiol (CBD), Potassium Ascorbate, Urea, Ceramide, L- Arginine, L-Serine and Lactic acid. Application: Use Hydradol twice daily on both the face and body to deliver essential hydration to dry patches of skin. 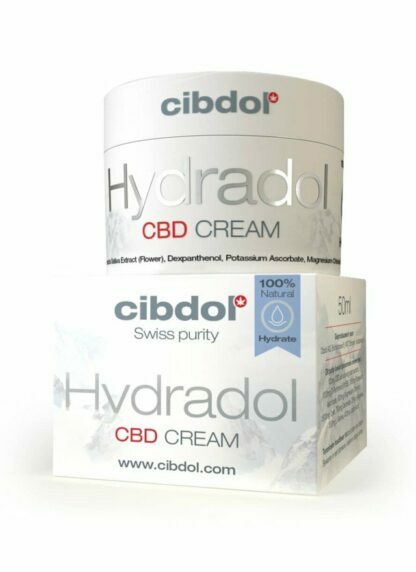 Cibdol Hydradol CBD Skin Hydrating Cream targets dry skin cells with the strength and therapeutic diversity of Cannabidiol. At Cibdol, we ensure that our CBD content comes in the form of full plant extracts from the Cannabis sativa plant. Calling upon the restorative powers of the natural plant phytocomplex, we have created a cream that puts quality and customer care at the forefront. Hydradol is comprised of several key ingredients that combine to administer a potent dose of nourishing, natural relief to hydrate dry skin. In addition to containing the active ingredient CBD, Hydradol also contains Potassium Ascorbate, Urea, Ceramide, L- Arginine, L-Serine and Lactic acid. The presence of Potassium ascorbate and Urea administer deep and long-lasting moisture to get you on the path to healthier skin. Ceramide, L-Arginine and L-Serine synergize to provide the skin with the important building blocks it requires to structure and mediate permeability in the skin water barrier. Cibdol is one of the foremost manufacturers of high-quality CBD products, and the CBD oils and salves that they manufacture represent an array of pure and potent products that maintain their exceptional standards of quality. To ensure that all Cibdol products are produced and processed with customer health and safety in mind, they extensively test their products in their Swiss laboratories. What’s more, they send the products off to third-party agencies to guarantee transparency. Cibdol CBD Cream – Hydradol. CBD, Potassium Ascorbate, Urea, Ceramide, L- Arginine, L-Serine and Lactic acid. Use Hydradol twice daily on both the face and body to deliver essential hydration to dry patches of skin.